The dean serves as a communicator between congregations, rostered leaders, the conference, and the synod. The dean is a resource for rostered ministers and congregations in the conference and is available to offer advice, share information, and as needed, to meet with congregations during times of pastoral transition, re-structuring, and conflict. The dean is the synod representative during the call process. The dean presides at conference meetings and serves as the chair of their Conference Council and works with them to enhance ministry in and through the conference congregations and associations. The dean is responsible for the administration of conference funds, (for which a Conference Treasurer can be identified to assist) and for the coordination of all activities within the conference. Other responsibilities include securing conference representatives for all necessary positions and preparing an annual conference report for the Synod Assembly. The dean encourages and facilitate(s) rostered persons in their calling and in the ministries of the conference and synod. The annual Synod Ministerium is planned by the Committee of Deans in consultation with the bishop; deans also actively participate in regular meetings of the Committee of Deans, convened by the bishop. The dean also works with the conference’s respective Regional Renewal Team. 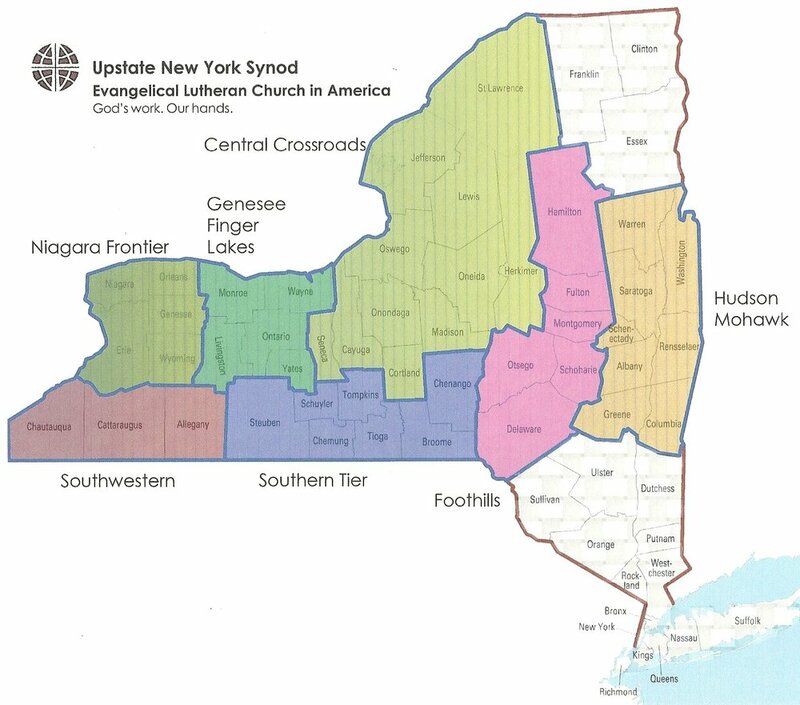 The Central Crossroads Conference is formed of 23 congregations which stretch from Cortland to Canada and Dolgeville to Skaneateles with the majority of our congregations centered in the greater Syracuse area. Our congregations include multi-cultural inner city ministries, suburban communities and rural outposts. Learning at the Crossroads is our educational ministry offering adult education opportunities across a wide range of subjects at little cost. The Foothills Conference is a grouping of 15 congregations from Schoharie, Otsego, Montgomery, and Fulton Counties. These contain some of the oldest congregations in New York State. On the territory of the conference, one finds a variety of settings from rural, small town-and-country, to small city. The objective of our congregations is to proclaim Christ crucified and risen in the context of an ever-changing landscape; we, therefore, innovate, venturing boldly to try different strategies to address our local situations. The Genesee Finger Lakes Conference is made up of 27 congregations in the area of Rochester and the western Finger Lakes. Congregational settings include: urban, suburban, small town and rural. The conference also includes the South Wedge Mission and the campus ministry at the Rochester Institute of Technology. Synod Assembly and the annual Synod Ministerium take place on the conference territory. Conference pastors meet monthly for ministerium and many join in a bimonthly study of upcoming worship texts. They also have an annual pre-Lent retreat. Some congregations have large and active youth programs and some do not. Open to all, but particularly useful for churches with small youth programs, is the conference's Lutheran Youth Organization. Several conference-wide events are scheduled every year; the highlight being Winter Weekend. No description of the conference is complete without noting its natural beauty. The lakes, waterfalls, gorges and mountains are breathtaking. Numerous wineries make use of the unique micro-climate created by the Finger Lakes. The Hudson-Mohawk Conference comprises Albany, Columbia, Greene, Rensselaer, Saratoga and Schenectady counties, bisected by the Hudson River. With approximately thirty-one congregations and thirty-three rostered leaders, ministry sites vary from rural and semi-rural to urban and suburban. We have an active monthly ministerium, providing collegiality and support for rostered leaders, an active Conference Deacon program and offer both teens and young adults opportunities to grow in faith and community through Confirmation and High School Camps. The Conference funding arm, FESMOS (First English, St. Mark’s and Our Saviour’s) was created from the closing of the congregations whose initials make up its acronym. FESMOS funds are used to support regional ministries across denominational lines. These include Protestant Campus Ministry at the University of Albany, the Emergency Overflow Shelter at First, Albany, Troy Area United Ministries (TAUM), Schenectady Inner City Ministry (SICM) among other agencies. The Southern Tier conference stretches from Sidney to Corning, Ithaca to the Pennsylvania state line. We have rural, suburban, inner city and village congregations; a generous and independent spirit. The Southwestern Conference includes 17 congregations across Chautauqua, Cattaraugus and Allegany Counties in town & country to small city settings. Southwestern boasts a strong sense of collegiality among conference clergy and deacons, with a corresponding sense of participation by congregations in conference meetings. Southwestern also hosts two unique synod ministries. Lake Chautauqua Lutheran Center (LCLC), a year-round center for outdoor ministry, offers a wide range of retreat and camp opportunities. Visit at lclcenter.org. Lutheran, centered at its campus in Jamestown, is a dynamic agency offering a comprehensive continuum of community, residential, and home based supportive services that help people of all ages gain or retain independence. Learn more at lutheran-jamestown.org.